I first saw a William Hannah notebook on Instagram and was immediately entranced. The supple leather, metal accents, and industrial-strength rings got my undivided attention. So did the price. I am a hoarder of notebooks. I love the smell of paper and all the different notebook designs available these days. It is hard for me to settle on just one notebook–and why should I? I am currently using a Hobonichi Cousin for my calendar, a Nanami Seven Seas Notebook for my journal, a half-dozen Word notebooks for various things, and a passport-sized Traveler's Notebook for my purse. Then there's my Baron Fig (blank, so far) and a trove of other notebooks sitting on my shelves for which I've yet to find a purpose. Why on earth would I need another notebook? Well, who doesn't always need another notebook? Besides, I figured that having a British-made notebook with buttery leather and lovely paper would inspire me to write poetry. I have a poetry thesis coming up, so I need to get more poems written. That's what my William Hannah Notebook is for . . . though I've yet to write even one poem in it. I have managed a calendar page. I originally planned to get the whiskey notebook with the kingfisher interior. But when I went to order my notebook, there was a lovely color called agave. I ordered that. I expected it to take up to two weeks to receive the notebook, so I was amazed when it arrived in five days. The packaging is fantastic, as you would expect from a British company. Everything is wrapped in William Hannah paper. A sampler packet of all the different sorts of paper you can order with your notebook. A packet of additional lined paper ("To maximize shipping costs to the US"). A card with extra hardware in case I want to remove the pen loop. The notebook itself is a simple design. It is made from one thick piece of leather with a suede interior. They offer many different colors. I chose agave which is a beautiful teal. You can even order custom colors if you wish. Both the outer and inner covers are stitched in a coordinating color of thread. The leather is luscious. It smells wonderful and is so smooth it makes you want to stroke and hold the notebook all the time–which is weird, and people will stare at you, so you might want refrain from this in public. Because the leather is so soft, it is prone to scratches and scrapes. But these will add character to your notebook as it ages. The only decoration on the front is a William Hannah pin made of steel with the initials WH engraved on it. The pin screws on, so you can opt for a pen loop, which is what I did. I'm not sure I will make use of the pen loop, though, since I rarely carry just one pen with me. I may remove it and go back to the simple pin. The only other decoration is the William Hannah logo engraved on the back. I wish the notebook had a closure system of some kind, for example, a loop that could be used with the pin. This isn't a deal breaker, of course, but I do like to keep my notebooks closed when not in use or while I'm carrying them. As stated above, the interior of the notebook is lined in suede. I chose the petrol color for the interior, but the agave notebook can also be paired with lime or fuchsia suede. I would like the option to have pockets sewn into the interior for cards and other loose items. The discs are made of 303 gauge stainless steel. These babies are meant to last and will not tarnish. They are sewn in place and are sturdy. The discs don't open and close like a three ring binder. They are solid rings. Instead, the paper is cut to fit the rings, and you can easily remove paper by pulling from the upper right downward. To insert paper, you simply press the pages onto the rings. What is wonderful about this system, is you can arrange and rearrange pages in any order you want. The 100gsm paper is magnificent. It is almost as thick as index cards and is smooth–no grainy stuff to clog up your extra-fine nibs. When you order your notebook, you also order paper, and you can configure it in any combination of 60 pages (or more, if you wish). They offer plain, lined, grid, and dot-grid paper. 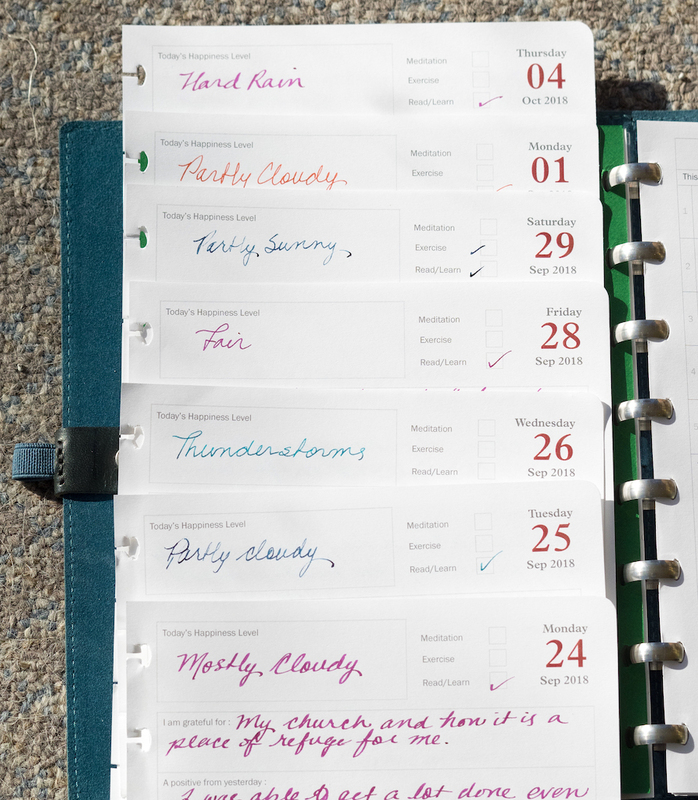 You can also choose templates for to-do lists and/or weekly calendar pages. You even get to pick the ink color for your pages. I chose 50 pages of lined and 10 pages of dot-grid in petrol-colored ink. I tested the paper with several different inks. The only one that didn't do well was MB Toffee in my Cross Concord nib. Admittedly, this is a super-wide, wet nib, and the ink feathered. All the other pens and inks worked perfectly on this paper. The paper has a little bit of show through, but absolutely no bleed through, even with the wettest inks. I did some ink swabs with some of my most saturated colors, and not one bled through. My only complaint about the paper in the William Hannah notebook is that it isn't perforated. When you pull sheets out, you wind up with a side that has snaggy edges, like spiral notebook paper. If the pages were perforated, you could remove these easily, and that's important for those of us who are OCD about smooth paper edges. I'm a professor, okay? I hate snaggy paper. A William Hannah notebook starts at £95 (=$137.54 at the current exchange rate). A pen loop is an additional £6, and shipping is £17.50. Bespoke notebooks start at £120. Paper refills are £5 for 50 pages and £9 for 100 pages plus shipping. You can buy an Atoma punch and use your own paper. However, the punch costs £139 at CultPens, so it's quite an investment. I couldn't find any American retailers who sell an Atoma punch. The William Hannah notebook is an expensive purchase. But I think it is worth every penny. The care that went into its creation is obvious. It is configurable to anyone's taste, and the paper is outstanding. The William Hannah notebook will last a lifetime. 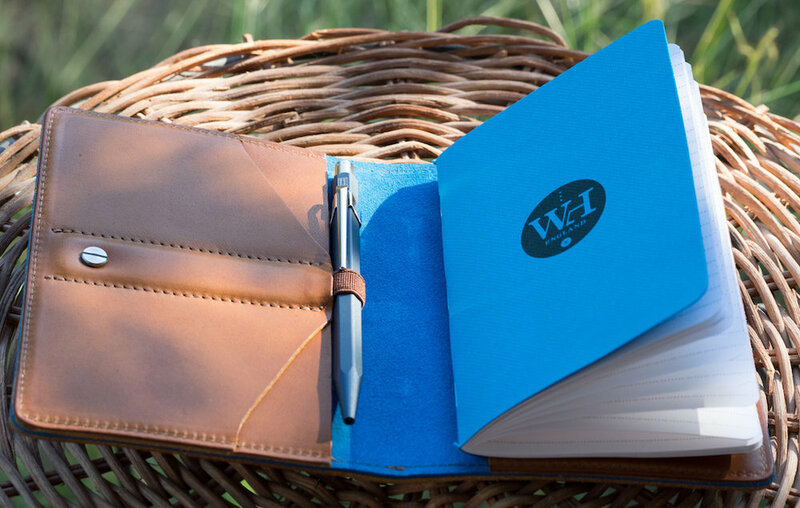 The William Hannah Notebook exhibits top-quality workmanship. It is configurable with multiple options for printed paper, including templates for weekly calendaring and to do lists. The ring system is sturdy and allows you to arrange and rearrange pages. The notebook lies perfectly flat when open. The leather is pure bliss and comes in many different colors. You can even create your own bespoke notebook. The 100gsm paper works well with any sort of pen or pencil, but it is especially good for fountain pen users. This is a very expensive notebook. The notebook does not have inner pockets nor is there a way to keep the notebook closed. When paper is removed it has snaggy edges. Refills can get expensive because of the exchange rate and shipping from England. Posted on June 17, 2016 by Susan Pigott and filed under William Hannah, Notebook Reviews.